Spotted Gum is a timber and honey tree originating from eastern Australia, where it occurs on the coastal fringe extending from Victoria, through New South Wales to south-east Queensland. Included in this description is the closely related but botanically separate Corymbia henryi, also known as Spotted Gum, as it differs only marginally from Corymbia maculata, mainly in its distribution which is limited to south-east Queensland. Spotted Gums are eucalyptus relatives that can grow into large trees up to 50 m (165 ft) tall, with a trunk diameter approaching 2 m (6.5 ft), though are more commonly around half that size. It is a handsome tree, with a straight trunk clear of branches for two-thirds the tree height, supporting an open, densely leafy, rounded crown. 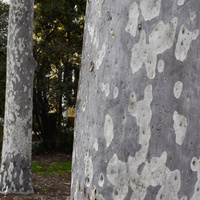 The bark is smooth, grey or light brown and shedding in patches, leaving the trunk with a mottled or spotted appearance. Much like its eucalyptus relatives, the leaves remain on the tree in all seasons and change shape as the plant matures, from ovate-shaped leaves on seedlings and juvenile trees to dark green, narrow lance-shaped leaves 12 to 25 cm (5 to 10 in) long on adult trees. Flowering occurs during the cooler months, from the end of autumn through to spring, with small oval buds arising in clusters of a few at the sides and ends of the branches. When open, the flowers have long white filaments surrounding a yellow centre. They are followed by brown, woody, goblet-shaped capsules containing tiny flat seed. Spotted Gum is reported as a major honey tree in its native Australia and in South Africa, with good nectar flows every three to four years, resulting in yields of up to 60 kgs (132 lbs) of honey per colony per season. The pure honey is extra light to light amber, of good flavour with caramel undertones, and is slow to granulate to a coarse brown grain. The flowers are also a valuable source of pollen for brood-rearing honeybees. The wood is medium to heavy in weight, in the 750 to 1080 kgs per cubic meter (47 to 67 lbs per cubic foot) range, and has moderate to good natural resistance to rot, decay and wood-boring insects. This puts it in the durable hardwood class, suitable for both indoor and outdoor construction. The sapwood is pale and the heartwood light to dark brown, often with attractive fiddleback figuring. Suitably sized logs are sawn into beams and planks used in construction, including house construction, indoor flooring, outdoor decking, seaside boardwalks, and for boat building. Small-diameter logs are widely used for posts and poles, including transmission poles. It is also reputed to be one of the most suitable Australian woods for tool handles. The sawmill off-cuts and branch-wood make an excellent firewood and charcoal. The tree's shapely form, smooth, mottled bark and shade-giving foliage make it a excellent candidate for planting as an amenity tree in urban parks, landscapes and large gardens. Grows naturally in humid subtropical and tropical mid- to high-elevation climates, generally areas with annual lows of 10 to 15 °C, annual highs of 20 to 26 °C, annual rainfall of 700 to 1500 mm and a dry season of 6 months or less. New plants are usually started from seed, which remain viable for several years under cool, dry, air-tight storage. The seed benefit from soaking in water before sowing and most will germinate within a week. They are best planted in containers with a free-draining potting mix and the seedlings cared for in a nursery for 4 to 5 months, or until about 30 to 40 cm (1 to 1.3 ft) in height. 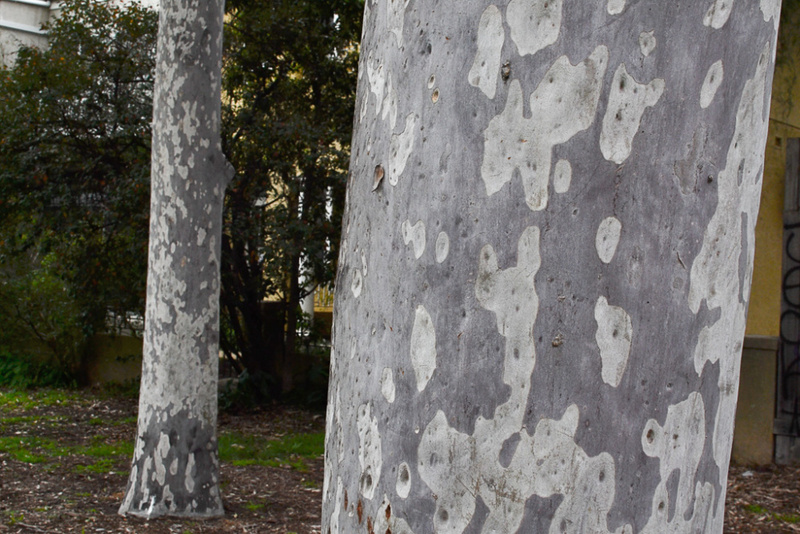 Spotted Gum trees perform best on free-draining clay-loam, loam, silt-loam and sandy-loam soils of a moderately acid to neutral nature, generally with a pH of 5.5 to 7.5 and on sites with full sun exposure. Spotted Gum is recorded as naturalised in parts of Australia outside of its natural range, but there does not appear to be any record of it anywhere as a serious weed or invasive species.